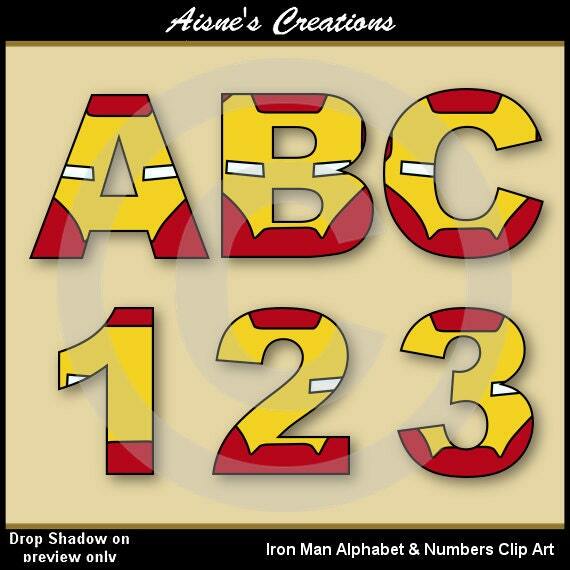 This pack contains a set of Iron Man clip art alphabet letters uppercase A-Z and a set of numbers 0-9 as shown in the preview. All images are in png format at 300 dpi. TEACHERS - These may be used for both classroom use and for creating teaching products. PRINTABLES - these may be used in products such as card making, party printables and other printables provided they are in a flattened form and incorporated within a printable product. SCRAPBOOKING - You may not include my numbers or alpha sets in any digital scrapbooking kit however you may use them in the creation of word art. HANDMADE ITEMS - My alpha & number sets may be used in the creation of handmade goods such as T-shirt printing (provided its for small business use only), wood items, applique, fabric painting etc. EMBROIDERY, NEEDLECRAFTS & CUTTING FILES - My graphics may not be used to create patterns for resale. You may however convert and create your own finished items to sell. If you would like to sell patterns created from my sets please contact me for license information.